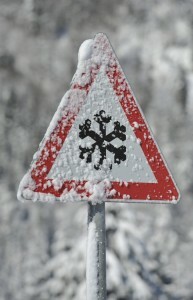 Continuing from Winter Driving Tips to Prevent Car Accidents (Pt. 1), here, we will point out some more essential winter driving tips to keep in mind if you will be driving in snow, sleet or other unfavorable winter weather conditions. Leaving more distance between vehicles and always wearing your seatbelt are two essential winter driving tips. Contact us if you’ve been hurt in a car accident. Leave more distance between vehicles – When the roads are wet and/or icy, it’s advised that drivers increase their following distances by 8 to 10 seconds (from the recommended 3 to 4 seconds under “normal” driving conditions). The reason for this is that it takes longer to slow down and stop vehicles on slick roads. With a greater following distance, you can be sure to have sufficient room to stop your vehicle without getting into a rear-end collision. Driver slower – When the roads are slick and icy during the winter, your vehicle’s tires will have less traction with the roads, making it more likely that skids will happen. To avoid this and maintain control of your vehicle, take it slower, maybe even a bit slower than the posted speed limit. Although you may have to leave a little bit earlier or plan for longer travel times, you can be sure to safely maintain control of your vehicle when you drive slower. Always wear your seatbelt – Of course, you should always wear your seatbelt (it’s not only the law, but it can save your life). However, it’s of the utmost importance to wear your seatbelt in the winter time, as you never know when you may lose control of your vehicle on an icy road and wearing your seatbelts can prevent catastrophic injuries if you do end up getting into an accident. Be sure to check out the conclusion to this blog series for some final important winter driving tips. Bring their cases to successful resolutions.